How do you know if it’s a second unit or an accessory dwelling unit? Is it a second unit or an accessory dwelling? How do you know the difference? If the post office gives the second structure an address, that makes it a second unit, right? Or if the dwellings are separately metered, it must mean there are two units. Let’s talk through some distinctions below, and then discuss a bit of a “monkey wrench” since there is an added subjective layer when making this call. The Short Answer: A second unit and an accessory dwelling might look like the same thing to a casual observer, but what matters most in determining whether a structure is a second unit or accessory dwelling is what zoning allows and whether the market perceives the structure as a second unit or not. The post office might have a separate address for an accessory dwelling, but that does not make it a legal and legitimate second unit. The utility company might have two meters on site also, but even that does not mean there are two units. The key comes down to the property being legal as two units in the eyes of the city or county, recognized by the market as a second unit, and even how the dwelling contributes to value. The Monkey Wrench: Part of determining whether something is an accessory dwelling or second unit comes down to its contributory value, and the appraiser is really going to have to give this some thought. For instance, some counties might legally consider any secondary structure as a second unit despite its size or how much value it really adds. But just because a city or county declares something is a second unit does not mean it should be appraised as a duplex (2 houses on 1 lot is considered a duplex). For instance, imagine Placer County considers a property with a 4500 sq ft house and a 300 sq ft detached studio as a duplex. But are these really two units? Don’t you think the added value would be fairly minor for the 300 sq ft studio? A property like this should probably be appraised as a single family residence with an accessory dwelling instead of two separate units (a duplex). While there may be two units technically in the eyes of the county, the 300 sq ft studio is hands-down really seen as an accessory dwelling by the market. In fact, some buyers wouldn’t hardly care about the small accessory dwelling because they are purchasing the property for the main house instead of whether there there is a 300 sq ft studio or not. Imagine a different scenario where there are two houses on one lot, but one is a complete tear-down. If one unit is beyond repair, it’s probably best for this property to be appraised as a single family residence because that’s how the market would see the property (instead of as a duplex). This is where a subjective element comes into play because appraisers have to consider how much value a secondary structure adds, and how the market sees that structure. What FHA says about Accessory Dwellings: An accessory dwelling unit (ADU) is defined as a habitable living unit added to, created within, or detached from a primary single-family dwelling and contained on one lot. ADU’s are commonly understood to be a separate additional living unit, including kitchen, sleeping, and bathroom facilities. ADU’s are subordinate in size, location, and appearance to the primary home and may or may not have separate means of ingress or egress. An attached unit contained within a single-family home, also known as a “mother-in-law apartment,” or a “garage apartment” that may or may not be attached to the primary residence are the most common types of accessory dwelling unit. An accessory dwelling unit sometimes involves the renovation of a garage, basement, or a small addition to a primary residence. The determination of whether or not an ADU is a second dwelling unit is to be made by the appraiser and indicated in the site analysis section of the report where zoning, highest and best use, and legal use are addressed. The fact that an ADU is rented or generates income should not categorically result in a determination that the property contains two dwelling units. What Fannie Mae says about Accessory Dwellings: An accessory dwelling unit is typically an additional living area independent of the primary dwelling unit, and includes a fully functioning kitchen and bathroom. Some examples may include a living area over a garage and basement units. Whether a property is a one-unit property with an accessory unit or a two-unit property will be based on the characteristics of the property, which may include, but are not limited to, the existence of separate utilities, a unique postal address, and whether the unit is rented. The appraiser is required to provide a description of the accessory unit, and analyze any effect it has on the value or marketability of the subject property (Page 583 of Fannie Mae Seller’s Guide). Why does this matter? 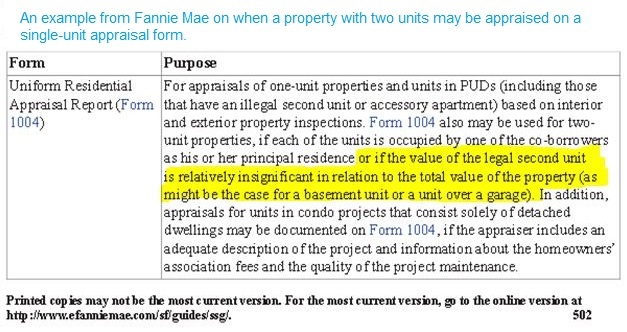 If there are two units, the appraiser will be comparing your two units with other two-unit properties. If you have a house with an accessory dwelling, the appraiser will be comparing your house with other homes with accessory dwellings. Keep in mind an accessory dwelling unit is NOT considered square footage if it is separate from the main living area, so it won’t be included in the total square footage of the main house (though it can still add to the value). NOTE on Local Requirements: There may be additional local code requirements for accessory dwelling units in terms of allowable size, parking spaces, setback, height, etc… There is not a once size fits all rule here for every state, so be sure to know your area. For instance, Sacramento County requires a 10 ft setback for accessory dwellings, one parking space for each bedroom, and a size no more than 1200 sq ft. Questions: Any stories or insight to share? Do you think it makes a difference whether a property has a second unit or an accessory dwelling unit?